Nigeria's secret service said Thursday it had discovered a Hezbollah "cell" in a house in Kano (northern Nigeria), where Lebanese citizens had concealed weapons to be used for attacks against "Israeli and Western targets" in Nigeria. Nigerian authorities said they had arrested three Lebanese in northern Nigeria on suspicion of being members of Hezbollah and that a raid on one of their residences had revealed a stash of weapons. The three suspects were arrested between May 16 and May 28 in the north's biggest city Kano, the military spokesman for Kano Captain Ikedichi Iweha said in a statement. One of the men had admitted to being a member of Hezbollah. A raid on the residence of one of the Lebanese had uncovered 11 60 mm anti-tank weapons, four anti-tank landmines, two rounds of ammunition for a 122 mm artillery gun, 21 rocket-propelled grenades, seventeen AK-47s with more than 11,000 bullets and dynamite, he said. The possibility of a link with Nigerian Islamist sect Boko Haram, which Nigerian forces are battling in the northeast, was being investigated, Iweha said at a news conference. An alliance between Salafist Sunni Muslim Boko Haram and Shi'ite Hezbollah would be a strange one, and there has never previously been evidence of a such a link. There are estimated to be several thousand Shi'ite Muslim Nigerians, a legacy of Muslim radical Ibrahim Zakzaky's preachings since the 1980s. Zakzaky still leads Nigeria's main Shi'ite movement and has campaigned for an Islamic government and stricter adherence to sharia, or Islamic law. Iweha did not say if any link to him was being investigated, and his movement is currently seen as largely peaceful. The Director of Homeland Security in Kano - the Department of State Security (DSS) - has told reporters that the owner of the premises where the weapons cache was discovered housed a "cell" of Hezbollah. "This is the work of Hezbollah. What we have just discovered is a Hezbollah cell," said the Nigerian responsible Bassey Pond, without advance evidence. The weapons found, he said, "should be used to target Israeli and Western interests in Nigeria." Journalists were taken to the house in the district of Bompai, where weapons were stored. 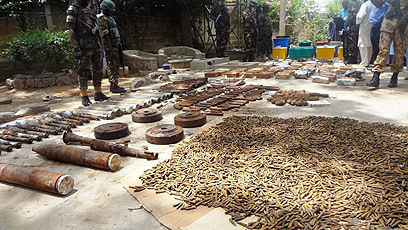 This cache, according to the Nigerian official, contained about 30 grenades, Kalashnikov rifles, ammunition and various types of explosive material. See all talkbacks "Nigeria arrests Lebanese suspected of Hezbollah ties"